I wrote a short story about a haunted lake. Read it here. It didn’t have a name. It was bad luck to talk about it. When they did whisper around the subject, the inhabitants of Nowhere, Texas called it the haunted lake. It was on the outskirts of their growing city. I wrote my first short story of 2017, it’s about a haunted house. Read it here. On a desk in a compound in the basement of an unassuming building, a telephone chirps madly. A woman, wearing the years on her face like a tree wears bark, extinguishes a cigarette and answers. Years ago I used to write interactive fiction as enthusiastically as I did short stories and unfinished novels, but until very recently I hadn’t touched the medium again. And here is the fruit of my nostalgic experimentation, a story titled Finch. Thanks are in order for Joseph Humfrey, who designed an IF scripting language that was pleasant to write in, and for Yannick Lohse, to whom I owe being able to make Finch playable in your browser. I look around his apartment for something I can hurt him with. I wrote a story about a cop who has visions of deaths that are about to take place. You can read it here. 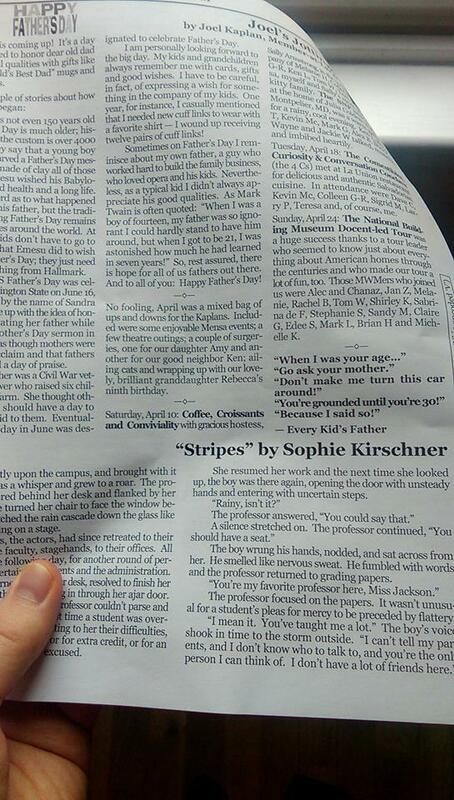 Capital M, a magazine published in the Metropolitan DC area, printed a short story I wrote. The story is dedicated to dear friends of mine who self-harmed and who shared their stories with me. I’ve been doing plenty of writing recently, though I have been very bad about actually finishing anything. But today I put my writer pants on and got a story DONE, which you can read here. Martha, Steven’s mother, took her prescribed antidepressants all at once. She woke, bleary, in an ambulance. Joshua, Steven’s father, held her hand tightly. Steven sat impassive in a corner that Martha could barely see. An EMT told Martha she’d be all right, and then she stopped breathing. It’s been a while, but I finally wrote another short story. You can check it out here! November is National Novel Writing Month and though I haven’t got the time to go all-out this year, I definitely intend to get some additional writing done before the month is through.